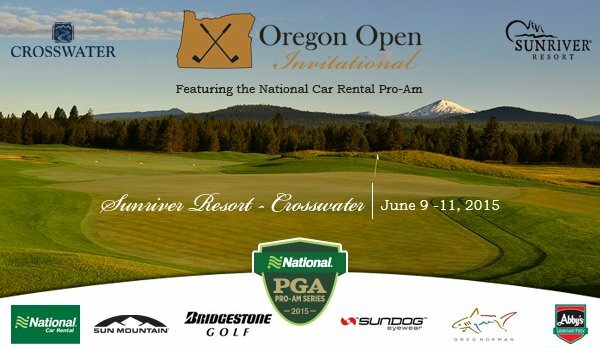 Oregon Open Invitational at Sunriver Resort – Entries Closing Soon! A few team spots are available for the Oregon Open Invitational at Sunriver Resort -Crosswater Course on June 9-11th. Entries close Wednesday, May 27th, so hurry and get your team entry in now! Host Professionals Josh Willis, PGA and Erik Mettille, PGA are excited to have us all. With a robust list of activities and magnificent resort amenities, Sunriver Resort offers an experience that will satisfy any palate. Located just 15 miles south of Bend, Ore., Sunriver Resort is a 3,300 acre all-seasons getaway destination known for its championship golf, award-winning spa, Northwest restaurants and outdoor pool facility. It is near extra activities such as fly-fishing, hiking, biking, rock climbing at Smith Rock, skiing, snowboarding and snowshoeing at Mt. Bachelor. Bend, Ore. is just a short jaunt away with an impressive selection of restaurants, breweries, cafes, events and art galleries. Sunriver is one of those unique locations that truly provides something for everyone; whether it’s your family or your team of favorite golf buddies! Did we mention the championship golf you’ll be playing? Crosswater, Sunriver Resort’s golfing gem, is a gorgeous 18-hole heathland-style semiprivate course situated on 600-acres of woodlands and carefully preserved wetlands. Crosswater is threaded by the Deschutes and Little Deschutes rivers adding a challenge (or boost!) as often as seven times in a round. This Robert E. Cupp designed course was named by Golf Digest as one of America’s 100 Greatest Courses and in 1999, and Golf Week named it one of the Top 10 best courses you can play in Oregon in 2014. Back again in 2015 is our National Car Rental Pro-Am Championship. Thanks to a nice sponsorship through the PGA of America, National Car Rental will be the sponsor of the team competitions – with a $7,500 contribution! This means there will be extra money to play for, in the team competition! They ask one thing – enroll all players in the Emerald Club, National Car Rental’s FREE tool to help you use the PGA discounted rate and also ease the rental process by allowing you to bypass the rental counter. To be eligible for the team competitions, all players on the team must be Emerald Club members (current membership qualifies) and there is a place on the entry form to provide each player’s Emerald Club number. Professionals can register by clicking here. It takes just a couple of minutes. Be sure to use PGA discount code XZ41557 when you rent from National. Amateurs can register by clicking here. It takes just a couple of minutes. Be sure to use PGA discount code XZ41570 when you rent from National. Last year, PGA Professional Derek Barron of Tacoma Golf Center played his way through 30 MPH gusts chipping away on every hole to take the Oregon Open Invitational by one stroke over PGA Professional Darren Black of Rainer G&CC. Michael Haack of Meridian Valley CC won low amateur honors. Winning the Best 2 of 4 Net competition was the team with PGA Professional Darren Black, PGA Professional Issac Henry-Cano, amateur Michael Haack of Meridian Valley CC and amateur Dave Miller also of Rainier G&CC. Winning the Four-Ball competition was also Darren Black and Michael Haack, shooting a 63-60-123, 21-under par. They won by four strokes over PGA Professionals Chris Van der Velde and his amateur Justin Kadin of Tetherow GC. We hope to see you all at Sunriver Resort – Crosswater in June!